Should eBay Start Paying a Dividend? The e-commerce titan has the financial soundness to pay dividends, but that doesn't mean the company should necessarily do so. eBay (NASDAQ:EBAY) has a rock-solid balance sheet and generates healthy cash flows on a regular basis. If management wanted to distribute dividends to investors, the company certainly has the financial resources to do so. However, just because eBay has the strength to pay a dividend, that doesn't mean that the company should necessarily embark on such strategy. As of March 31, 2016, eBay has $11.4 billion in cash and liquid assets on its balance sheet. This is calculated as the sum of cash and equivalents, short-term investments, and long-term investments. Financial debt is nearly $9.1 billion, so the company has a net cash position, and the balance sheet offers no reason for concern whatsoever. Even better, the business generates considerable amounts of money on a regular basis. The company produced over $4 billion in operating cash flow during 2015, and capital expenditures absorbed only $668 million of that money. This means that eBay retained nearly $3.4 billion in free cash flow last year. This is money that management can theoretically allocate to different uses, such as paying a dividend or buying shares back, among other possibilities. A considerable portion of eBay's free cash flow is allocated to share buybacks. The company repurchased stock for $2.15 billion in 2015, and management assigned $1 billion to buybacks during the first quarter of 2014. eBay has been actively buying back its shares since 2014, and this has reduced shares outstanding by a meaningful 11%. EBAY Average Diluted Shares Outstanding (Quarterly) data by YCharts. 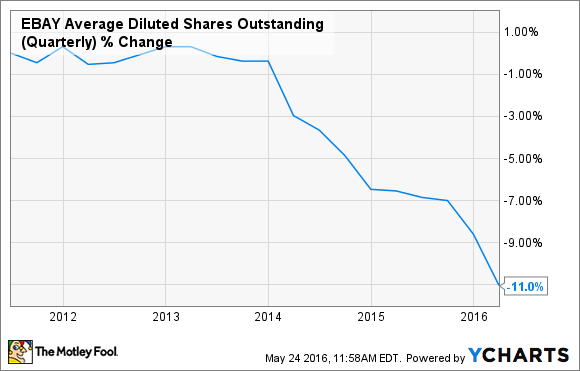 Should eBay pay a dividend? A company has basically five possible choices when it comes to allocating capital: reinvesting in the business, making acquisitions, paying down debt, paying dividends, or repurchasing shares. The last three alternatives -- dividends, buybacks, and debt paydowns -- are capital distributions. eBay is increasing investments in key areas such as technology to improve the customer experience, but the business still generates far more cash than it needs to reinvest. Acquisitions can be a promising growth venue as long as the company buys the right businesses for the right price, but that depends on the particular opportunity. Speaking of which, eBay has recently announced the acquisition of Ticketbis, an international ticket marketplace with a presence in 47 countries, for an undisclosed amount. Ticketbis will become part of eBay's StubHub business, which is producing impressive performance for the company. StubHub's gross merchandise volume jumped 34% year over year last quarter, so the company seems to be doing the right thing by strengthening its position in the global tickets business. The main point is that investment decisions and acquisitions need to be made on the basis of risk versus profitability, and the business is producing more money than the company needs to allocate to those areas, so the company will most likely continue distributing capital to investors in the coming years. Reducing debt doesn't make much sense for a financially sound company in times of historically low interest rates, so it all comes down to dividends vs. buybacks. The way I see it, management is doing the right thing by focusing on buybacks as opposed to paying dividends. To begin with, eBay stock is trading at particularly cheap levels. The stock carries a price-to-earnings (P/E) ratio of 14 times earnings over the last year. As a reference, the average stock in the S&P 500 trades at a P/E ratio around 19, and companies in the e-commerce industry trade at an even higher average PE ratio near 32. By investing in its own stock, eBay is buying a profitable business at a conveniently low price. Besides, buybacks are far more flexible than dividends. A company can increase or decrease share buybacks depending on convenience at a specific point in time. When it comes to dividends, on the other hand, investors typically expect recurrent and even growing dividends over the years. eBay operates in a dynamic industry, and the company could find promising opportunities for growth via acquisition in the future. If that happens, it would be nice to have as much financial flexibility as possible, and buybacks look like a better idea than dividends from that perspective. eBay has the financial resources to pay a dividend if management decided to do so. However, share buybacks and strategic acquisitions look like a better use of the company's capital at this stage.